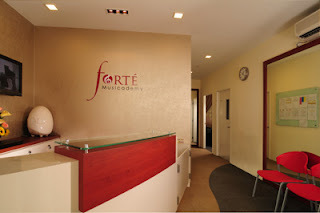 In music, Forte means loud and strong! It also refers to a person’s strong point. To develop in every student a strong and complete foundation for music making, to discover their forte, stretch their potential and cultivate their passion for music. To imbue in our students, through musical training, perseverance and discipline, the essential virtues of lifelong achievement. Weekly lesson on the instrument, as well as the weekly theory and aural classes to enhance the musical knowledge, students are encouraged to excel at their own pace. Masterclasses will be scheduled for students to exchange their views on playing and have an exposure to different schools of thoughts given by other masters. Performance platforms are provided as we believe music is a means of sharing and reaching out to others, and in return, to enlighten ones’ inner self. Ensemble and chamber music workshops are added to broaden scopes of performances and musical experience.